Did you know your nose has its own cycle? A whopping eighty percent of us have a nasal cycle. Meaning that congestion alternates from one nostril to the other throughout the day. We just don’t usually notice because our two nostrils together provide enough air. 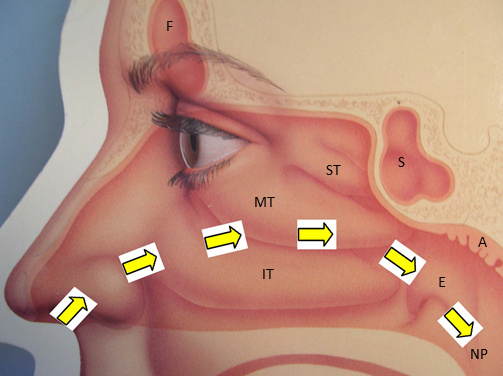 The purpose of the nasal cycle? Scientists think it lets the nose rest. Because here’s your nose’s day: purify, warm, humidify. Purify, warm, humidify. In this rotation, the congested side gets to take a break. The cycle is probably regulated by the hypothalamus. That’s a Vienna-sausage-sized structure in the brain that controls other important unconscious body functions, like heart rate and hunger. Indian yogis first documented the nasal cycle several thousand years ago. They linked all kinds of ailments to an irregular cycle. Too much flow through the left nostril can result in chronic fatigue and reduced brain function. Too much through the right, mental and nervous disturbance. But don’t panic! Just keep breathing easy. You’re in the capable hands of your hypothalamus. Wherever that is! Ah! I mean, ommm.